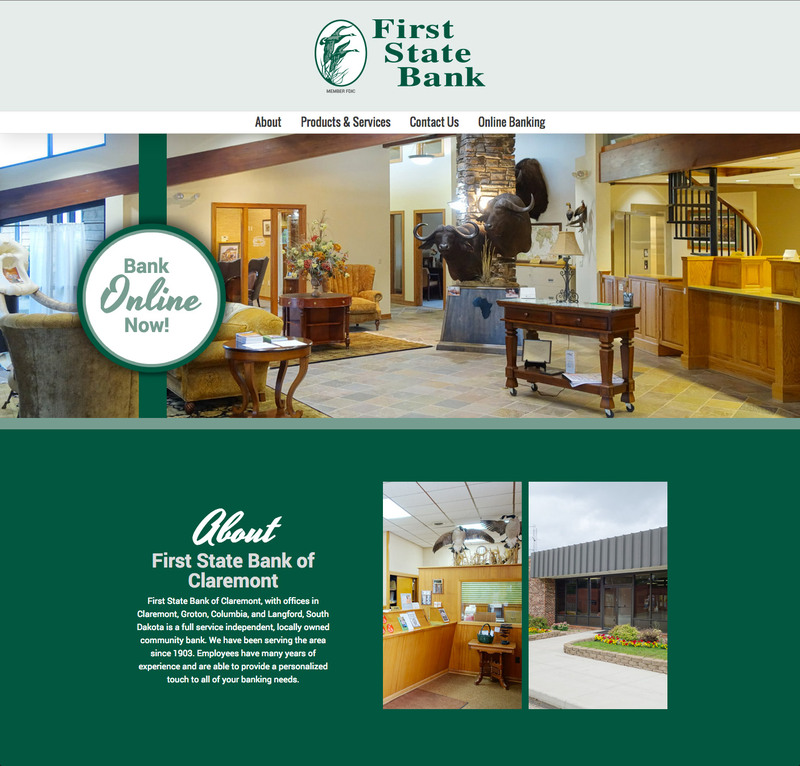 The First State Bank of Claremont has been serving the Claremont, Groton, Columbia and Langford areas for more than 110 years. Their personal approach to banking and down-home style has been appreciated by their community for decades. In keeping with that, they came to McQuillen with one request. They wanted their new website to be simple, and serve only as a portal to their online banking site. No confusing links, no extra fuss. Needless to say, making an attractive and interesting website with only one true function proved to be a unique challenge. Our goal was to make an attractive, engaging site that looked impressive and professional while still being simple and user-friendly. We included an about paragraph describing their long-standing role in the community, as well as a list of their products and services. We also included a parallax effect on the Products and Services banner, showing a close up of one of the many hunting trophies in their office. We incorporated a lot of their company colors into their site, and included some professional photos of their locations so that the comfortable aesthetic of their offices could be felt just as easily online as it does in person. Their entire site consists of one page and the addition of all these features helped balance out the simplicity of the site’s functions. We can answer just about any questions about websites. We have over 80 websites under management. Call us today at 605-226-3481.